Back at the start of October it was Get Graphic readathon, for this event I read the entire USNA series. I loved it! A time in the future when our two great countries, Canada and the United States, have amalgamated. Within the U.S.N.A. and especially in parts of the former country of Canada, there is a growing discontent. Family farms have been replaced by huge corporate farms that exploit the bulging prison populations as labour. Severe drought has lead to food shortages and rationing in the cities. The young people are being conscripted to fight in the Cent-am wars. The groundswell of rebellion is building and the rebels are planning the return of their leader, the exiled ex-prime minister of Canada, Samuel Stern. To combat this threat, a new organization has been created by the administration of USNA. It’s a covert homeland security force; the Strategic Home Alliance Defense Organization (S.H.A.D.O.). Operating on the fringes of the law, their mission is simple: locate and eliminate any rebel activity using deadly force if necessary. USNA: The United States of North America is the story of the people’s fight against tyranny. It takes place in our backyard. I give USNA complete series by Harry Kalensky, David Longworth and Allan Stanleigh four out of five hearts. I loved it, there were just a couple of things I did not like that much. Like the change of drawing style between the first and second series. 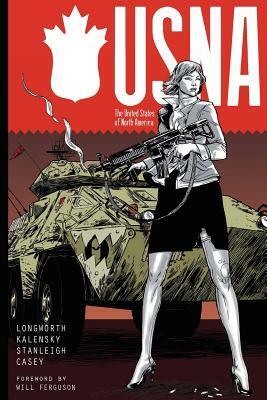 When I started reading USNA I, I immediately fell in love with the drawing style and story. But the drawing style changed because they went with a different artist for the rest of the series. Which was more comic like then before. And I actually thought the first style really fit the griddy style of the graphic novel. Overall the story of the complete series is great. I loved it from the moment I started it until it was over. And then I still wanted more, but the story did feel complete. I just liked the world so much. I got these graphic novels send to me by Allan Stenleigh in exchange for an honest review. This entry was posted in Book Review and tagged Allan Stanleigh, Book Review, Comic, David Longworth, Fantasy, Harry Kalensky, History. Bookmark the permalink.